Posted in 52 Ancestors Challenge on January 15, 2014 by Amy Johnson Crow. Another great week in the 52 Ancestors in 52 Weeks Challenge! Lots of incredible stories, including Kyla’s post about a tragedy in the Schrader family that led to more than a thousand people at a funeral. Note: There are currently 212 blogs that I’m tracking for this in Feedly (my current favorite blog reader). To increase the odds of me seeing your post, include the phrase “52 Ancestors” in the title of the post. Thanks! EGGELSMANN – “#2 Wilhelm Eggelsmann” by Joanne Clyde on Do You Know the Muffin Man? HARRIS – “#1 Dr. Herman Lee Harris” by Piper Oneto on What Do You Mean We’re Irish? JOLLETT – “#2 William Jollett” by Wendy Mathias on Jollett Etc. LEE – “#1 James Henry Lee” by pwhite1048 on Who ARE You People? WEBB – “#1 Susan Webb – The Perils of Being Given Work Done By Others” on Whereswoolly Now? I agree, Helen! This is a great project and I’m so glad we get to see what everyone is writing about. I’m amazed that 212 of us are participating. Love it! Can you add mine? Just went live this morning. I love this project! I have been posting ancestor stories – maybe I will have to rename my column and join your very cool bandwagon. Boy, Amy, you sure loaded up your plate with this one. If everyone keeps posting and more get added each week this will become insane! Your week as Wed through Tue does make sense and I’ll be posting on Friday to make this into “Fifty Two Ancestor Friday”. 212! That’s awesome!! Thank you so much for adding my story about my grandmother Tennie Belle Holcomb!! I finished my second post yesterday on my great-grandmother Wilhelmina Albertina Johannson, and found additional info I didn’t know before!! I believe this challenge is going to help me uncover even more!! Thanks for that too!! That is a very impressive number of blogs that have joined your challenge. Congratulations on hitting a point of interest with so many people! I’m happy to be taking part, and at this point, somewhat amazed that I’m not seeing any of the many, many names in my family tree on the list. Thank you, Amy, for coming up with such an appealing challenge and not least for the not inconsiderable work in giving us a list of participants. I have taken part in a number of challenges before and find it frustrating when no link is provided t to other participants who are not on my reading list. . So I do appreciate what you are doing and wish you luck in keeping up with the pace! Thank you again for sharing this idea. Beyond reading what other’s share, I am excited to see which stories I will find and share over the next year. It’s wonderful that so many are taking the challenge. Thanks for posting mine! Can you please change the URL it directs to? Either to http://tinyurl.com/ebreitjacobs or http://livesentwined.tiddlyspace.com ? Sorry — the link you have does not render correctly, due to some technology issues with my Wiki. I am having a blast reading everyone’s posts. Checking out familiar names looking for clues. This was a GREAT idea. 52 Week Ancestor #2 Newman James Williams at http://elusiveancestorhunter.wordpress.com/2014/01/, really getting me motivated! Thanks for the challenge! There are some really moving stories this week. I received a comment last night on my week #3 post from Sigrid Bjorkland’s great grandnephew!! So happy that she found her family! Thank you!!!! Yay!!!!!! A cousin just found my week #2 post! I wish I did this years ago! Thank you! I’m new to this blogging stuff. Do we need to comment on each post we do for you to include it in your weekly recap? Or does it come up automatically because you’re tracking them on Feedly? I’ve never done this before. If we are to post each week, I’ve finished my week 3 post on my blind gg-grandfather Francis Marion Lock(e). The link to this post is http://myancestorsleaves.blogspot.com/2014/01/52ancestors-challenge-week-3-i-am-blind.html. Thanks for taking on this great challenge!! You don’t need to leave a comment. As long as I have your blog listed on the “Blogs Participating” list, just put “52 Ancestors” somewhere in the title of the post and I should see it in Feedly. Thanks! The surname recap is an excellent idea. It’s a mighty helpful resource, and I look forward to landing on a common ancestor from someone else’s 52 Ancestors effort. 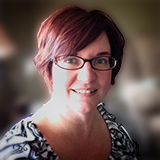 Amy, I just posted my second ancestor for this week, and I will leave my link. But I am confused as to how or where I should let you know. I want to continue with 52 Ancestors, but need to know that part of it. Thank you! I have your blog listed in Feedly (the blog reader I use). As long as you include “52 Ancestors” somewhere in the title of your posts, I should find them. Thanks! 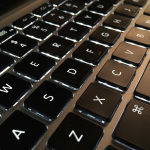 I am not sure if you go the corrected blog address and name, but I just posted my second week. Here is the correct information. My first blog for the 52 week challenge. I finally completed it. What a great project! Wonderful! 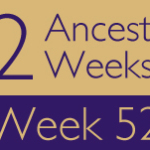 Be sure to put “52 Ancestors” somewhere in the title of your posts that you want included in the weekly recaps. Otherwise, I won’t see them in my blog reader.